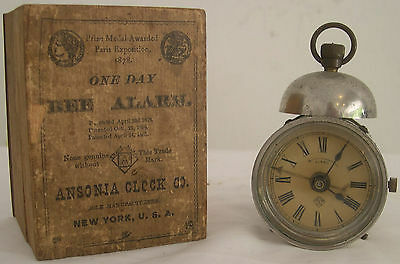 The ‘BEE’ clock, made by the Ansonia Clock Company in Connecticut, USA is a classic! A small tin can – actually brass plated with nickel / chrome, is about two and a quarter inches in diameter and about the same thickness. 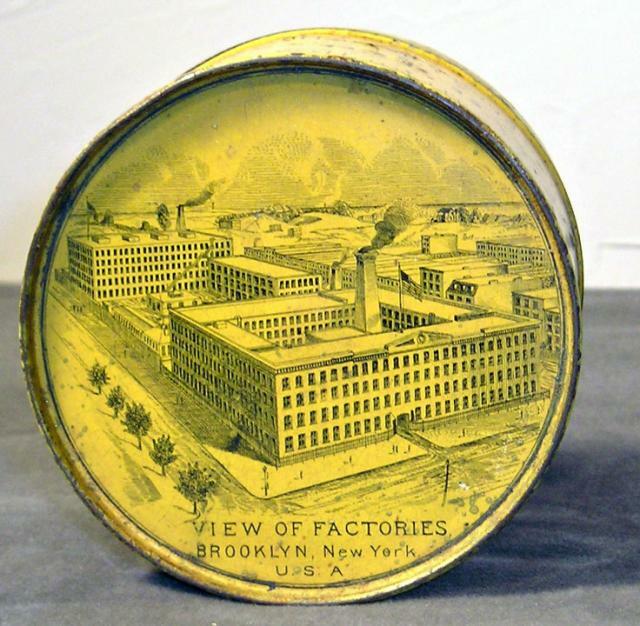 Packaged in pretty yellow or orange coloured tins with a picture of a nice bee on the side and a view of the Ansonia Clock Factory on the lid, they are on every collectors ‘must have’ list. They were marketed as 30 hour clocks. One classic feature was that the winding mechanism was built into the rear cover. This meant that the main spring was almost the entire diameter of the clock and was in a sense separated from the rest of the movement. It was fastened into place with a convex spring clip that held it to the rest of the movement. Two small legs screwed into the case at the bottom and a small bow on the top served to fasten the movement withing the ‘tin can’ or drum. Most had a plain paper dial while some had slightly more ornate dials –usually a stamped brass centre to the chapter ring. Most of the Bees have an engraving on the winding lid, ‘Pat Apr 23 1878’ and ’Made in the United State s of America’. The clock won an award in an exposition in Paris the same year. I discovered an almost identical clock made in the United kingdom in my collection. The winding mechanism in principle is almost identical to that of the Ansonia Bee, except that unlike the Bee, it uses a more traditional rachet wheel and pawl click mechanism. 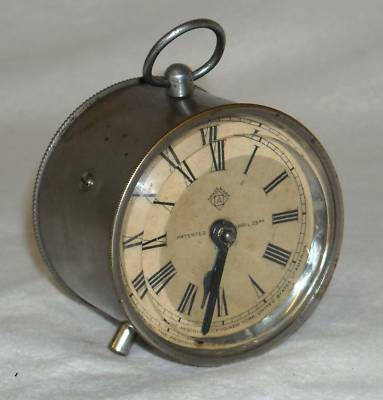 ‘Patented in Great Britain and France ‘ and ‘Made by the British United Clock Company’ in ‘Birmingham England’. Even after more than a century, these clocks work beautifully when restored and serviced. There have been some later imitations using more traditional movements with a smaller contained main spring. I have a Japanese one made by Seikosha. It looks just as pretty but the differences are apparent when you look at the back. The Japanese one has an enamel chapter ring with an ornate pressed brass centre. The Bee also had a more complicated version that had an alarm. The gong, comparatively large and dome shaped sat on top of the clock. These clocks came in beautiful wooden boxes unlike their smaller cousins. Some of these basic ‘Bee’s’ were made so that the standard ‘tin can’ drum could be inserted into a more ornate case with a cylindrical aperture. O f all the clocks that i have come across, the Bee is the most aptly named, and still creates a buzz! ← Going round in circles! Time Travel or Travel Time?